On 7th of February, the 30-months SUNFRAIL Project was concluded by its Final Conference in Bologna, Emilia-Romagna Region, Italy. 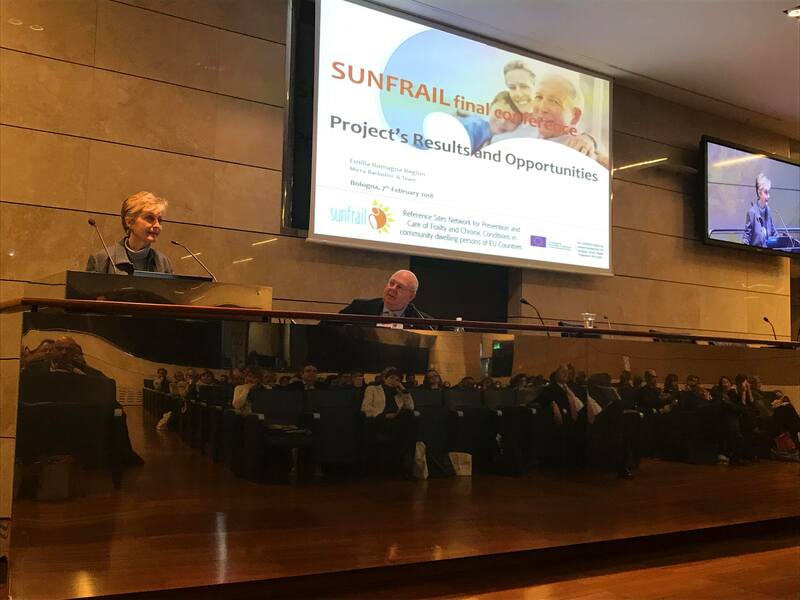 The final conference gathered high-level European and international speakers, national, regional and local health authorities and stakeholders and SUNFRAIL project partners to present and discuss the SUNFRAIL project’s result and opportunities for future adoption and replicability. The SUNFRAIL Project was invited by the Committee on Environment, Public Health and Food Safety of the European Parliament on the 22nd of November 2017 as a success project of the Third Health programme. Coordinator Mirca Barbolini, Emilia Romagna Region ASSR, presented the SUNFRAIL Project and its outcomes at the workshop. Among its major achievements are the SUNFRAIL Model for frailty and multimorbidity, the SUNFRAIL tool for early detection of these conditions and the SUNFRAIL human resources tool for training of health professionals with an interdisciplinary approach. Ms Elisabetta Gualmini, Minister of Welfare Policies in Region Emilia-Romagna, opened the SUNFRAIL Final conference by addressing the demographic change challenge and the importance of early detection of frailty. Following, during the session of “Policies and programs on frailty and multimorbidity”, Mr Giovanni Nicoletti, Office of the Secretary General, Italian Ministry of Health, presented the Ministry of Health’s support to Italian partnership in EU projects. The Ministry of Health currently have a national plan on chronicity where a steering committee is in place, and a national prevention plan concerning the areas of health promotion, healthy lifestyles and healthy ageing. In the session of “Initiatives to address frailty and multimorbidity” existing networks and actions to address frailty were presented to participants, such as the network of Italian regions Pro.M.I.S (PROgramma Mattone Internazionale Salute) and the European Commission Funded Joint Action on Frailty AdvantAGE by Prof. Leocadio R. Manas. Ms Mirca Barbolini, Coordinator of the SUNFRAIL Project from the Regional Agency for Health and Social Care of Emilia-Romagna Region, presented the project results and outcomes by addressing the elements of success regarding the SUNFRAIL Model and related tools. Particularly, the results of the testing of the Sunfrail tool in different settings indicates that the tool is especially suitable to identify frailty risk factors in community and primary care settings and to support selection of proactive interventions aimed to prevent disabling conditions. Overall, the tool has proven to be 1) Understandable, 2) Easy to use by professionals, and community actors, 3) Empowering beneficiaries 4) Connecting services (health, social, community care), 5) Supporting a multidisciplinary approach to frailty. Reinforce the message to policy makers across Europe that frailty is a reversible condition, and needs to be addressed through its main dimensions and early identification of risk factors, to orient proactive and preventive strategies. It is important to adopt a more holistic approach to frailty that considers its biological, neuro-psychological and socio-economical dimensions. Frailty risk factors can be identified especially in community and primary care settings, targeting a population that may be unknown by services. To address frailty in a sustainable way requires broad interdisciplinary approaches and integrated strategies connecting existent health, social and community services. This should be embedded in activities aimed at joint planning and funding forecasts involving relevant stakeholders from the national, regional and local level. It’s important not to underestimate the challenge of implementation. Use the evidence to create a compelling local story and use existing structures to drive adoption where possible. Use existing structures to accelerate good practices exchange such as EU networks and national agencies. Addressing reversible frailty is an issue relevant to an increasing proportion of European population and should be addressed on a EU-level to ensure greater added value.Frailty can be understood as the ability (resilience) of the individual to adapt accordingly to the changing of their conditions, both in physical, emotional and environmental perspectives. The SUNFRAIL tool may be used for early screening of multidimensional frailty and to assess whether an older person needs both a more comprehensive and integral geriatric multidimensional assessment as well as a care-needs assessment. This can be followed by tailor-made, personalized interventions with the aim to prevent avoidable deterioration of the situation leading to adverse outcomes. Current frailty screening (e.g. screening with an instrument like the SUNFRAIL tool) could be used as complementary by screening of the strengths of frail older people or it could develop towards an assessment of the frailty balance, referring to the balance between losses and deficits on one side and support and autonomy of older people on the other side. The last recommendation concerns interventions aimed at frailty. There is a progressive tendency to adopt a person-centred approach that encourages the autonomy and empowerment of the elderly and frail person. Even when vulnerable people lose control or are unable to influence their surroundings, they still strive to manage their frailty and remain committed to the community. The project has provided fruitful ideas for the continuation of activities related to the improvement of identification, prevention and management of frailty and multimorbidity care. Among these, improving existing pathways, fostering intersectoral collaboration, interdisciplinarity approach between professionals, and the active participation of beneficiaries are among the key actions for the application and replication of the tools identified by the project. © Sunfrail 2015. All rights reserved.